The comeback of Node in 2014 was undoubtedly one of the biggest happening in the story of EM these last years. Only the death of Edgar Froese aroused as many reactions. Why to make this link? Because it's further to a concert of Tangerine Dream in 1975 that the sting for this kind of art began to germinate in the mind of Mark Ellis, alias Flood. And a concert of this English quartet is the equivalent of these legendary concerts of Franke, Froese and Baumann in the 70's, in the sense that the level of improvisation is rather high. 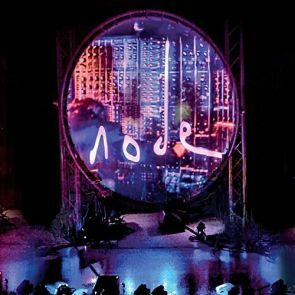 This concert, one of the very rare of the English band, was presented at the prestigious London's Royal College of Music and proposes more than one hour of totally new music where the sound fragrances of Ricochet, Phaedra, Stratosfear as well as the last album of Node are floating through the heavier England School style of Node. Take note that the 5 tracks of this concert are divided and mixed as individual title and the applauses were removed, giving the illusion that “Node Live” is a studio album. Thus, it's through some recollections of the mythical album Encore, the Cherokee Lane track, that the ambiences of "Shinkansen North" are opening. We can say also that it's almost similar to the opening of "Shinkansen East". A synth layer, of which we bind easily its tone to that of a train floating on its rails of marshmallow, gathers fellow lines to weave an opaque wall of atmospheres from which the graceful movement remind those of a waltz in heavens. Celeste and sibylline, the departure of the Shinkansen Japanese train for the North sets in motion near the 4 minutes' point. The movement of the sequencer is heavy and fluid while the veils of synths make very TD of the 76-77 years. One swims in the fury of "Shinkansen West" but with beautiful additions to its breakneck pace. Huge jingles decorate the race while the movement of the rhythm widens its zigzagging tentacles in a hallucinating sound decor where every second is filled to the full. Vintage electronic effects become allied to those more contemporary while the rhythmic bend rolls at top speed, being whipped by wonderful percussive effects and making even more pleasant this title which originated from Node 2. The universe of "Shinkansen North" remains chthonian with effects of synths and layers with a hint of voices which sound as hooting of specters. Always in movement, the rhythm stays in awaiting for the convulsive movement of the sequencer and the percussions which restructure it for a heavy approach of a Techno for one-legged people on amphetamines. As for them, the synths take the shape of this evolutionary structure of the sequencers and of the rhythmic pounding percussions by adapting their solos and their ambience's veils to the accelerations and the decelerations of a rhythmic structure which is very far from the minimalist approaches that we usually associate to EM. My ears buzzing and the walls resounding, "Perpertuum Mobile 1" comes along with its mass of ambiospherical and ambiosonic elements. The movement of the sequencer structures an oval ascent while the synths free some anesthetic perfumes. Decorated with very good sound effects, one of the big strengths of this album, the structure evolves slowly through the chants of the synths. Another line of sequence gets in. Its keys get grafted to its contiguous movement. The adding of castanets and of percussive effects create an imperfect rhythmic double shadow which beats with more vigor, while being sober, but very effective in the background, the synths continue to spread a chthonian veil. "Arrival" is a title of atmospheres unique to Node's repertoire. Muted knockings, one would say rustles of metallic doors, chants of extraterrestrial locusts, hoarse breaths in an effect of didgeridoo and voices mumbled by a synth; these ambiences put down a luciferian aura where sparkles a rosary of arpeggios glimmering in the electronic effects of the Exit years. Bass pulsations give a perception of Groove to this structure which limps with a hypnotic effect, while percussive effects, another element of indisputable charm in this “Node Live”, stimulate a structure which stays in the field of the floating rhythms as such which flirts between a classical Node and the surrounding areas of Arc's aerial melodies. "Shinkansen South" concludes the course of the Japanese train with an introduction of electronic ambiences of the vintage years. The rhythm which develops is built on sequences which flicker in the trail of a good line of bass and percussive delights. It goes up and comes down in oval loops with fragrances of the golden age of EM. Synths are unchained as well as the sequences and percussions which never stop to amaze our sense of hearing. They are in symbiosis with the phases of rhythm and sculpt strange aerial airs as well as ectoplasmic harmonies, such as a concerto for specters which are drag down from the oblivion to hell. One can even hear the effect of a guitar and its loops which echo in a tumult more and more controlled by Node. After this peculiar rock, "Shinkansen South" lands in a long ambiospherical finale where the Mellotron reigns in absolute master within its mythical mist. Some great Node that is! "Perpetuum Mobile 2" also arises from a broth of ambience elements before following the curve of a floating rhythm sits on a meshing of pulsations and motionless sequences. Synths are totally intrusive with layers and jets of chthonian sounds while multiplying many effects which divert our ears of a rhythmic formation which offers itself like in a state of collective hypnosis where dozens of torsos rock themselves in the unconsciousness. A little like a big feline following its prey being dying, the rhythm takes the various angles of the moods without ever really exploding. The beast won't eat after all, containing its fury in an atmosphere which reaches the summit of our waits. It would seem that there have been never so many analog synths and sequencers on the same stage during this concert, and we can hear, we can feel it. I have already written it in my review about Node 2, never I would have thought that so many sounds, tones, elements of ambiences and rhythms could get out of these machines and this in such a cohesion. For me, that is beyond belief! Without weaknesses and without a single second of lost, “Node Live” is the quintessence, the summit of the creativity in the universe of the contemporary EM. A pure masterpiece and a delight for my ears! I am convinced that it should be the same thing for the very great majority of aficionados of the Berlin School style, heavy and livened up by a brute force! Available on May 18th in a limit of 2000 manufactured CD by DiN Record. Le retour de Node en 2014 fut sans aucun doute l'un des plus gros happenings dans l'histoire de la MÉ au cours des dernières années. Il y a seulement mort d'Edgar Froese a suscité autant de réactions. Pourquoi faire ce lien? Parce c'est suite à un concert de Tangerine Dream en 1975 que la piqure pour cette forme d'art a commencé à germer dans l'esprit de Mark Ellis, alias Flood. Et un concert de ce quatuor Anglais est l'équivalent de ces légendaires concerts de Franke, Froese et Baumann dans les années 70, en ce sens que le niveau d’improvisation est assez élevé. Ce concert, un des très rares du groupe Anglais, a été présenté au prestigieux London's Royal College of Music en 2015 et propose plus d'une heure de musique totalement nouvelle où les fragrances soniques de Ricochet, Phaedra et Stratosphere flottent à travers le style plus lourd et England School de Node. Fait à noter; les 5 parties de ce concert sont divisées et les applaudissements sont enlevés, donnant l'illusion que “Node Live” est un album en studio. D'ailleurs c'est à travers certaines réminiscences du mythique album Encore, Cherokee Lane, que s'ouvre les ambiances de "Shinkansen North". On peut dire aussi que c’est quasiment similaire à "Shinkansen East". Une nappe de synthé, dont on lie facilement sa tonalité à celle d'un train flottant sur des rails en marshmallow, ramasse des semblables afin de tisser une muraille d'ambiances opaque dont les gracieux mouvement rappellent ceux d'une valse dans les cieux. Céleste et sibyllin, le départ du train Japonais Shinkansen pour le nord se met en branle aux portes des 4 minutes. Le mouvement du séquenceur est lourd et fluide alors que le chant des synthés fait très TD des années 76-77. On nage dans la furie de "Shinkansen West" mais avec de belles additions à ce rythme infernal. Des cliquetis énormes agrémente l'écoute alors que le mouvement du rythme étend ses tentacules zigzagants dans un hallucinant décor sonique où chaque seconde est remplie à plein. Des effets électronique vintages s'allient à ceux plus contemporain alors que la sinuosité rythmique roule à fond de train tout en étant fouettée par de superbes effets percussifs, rendant encore plus agréable ce titre qui a pris naissance dans le 2ième Node. L'univers de "Shinkansen North" reste chthonien avec des chants et des effets de synthé qui s'apparentent à des ululements de spectres. Toujours en mouvement, le rythme reste à l'affût du mouvement convulsif du séquenceur et des percussions qui le restructurent pour une lourde approche de Techno pour unijambistes sur les speeds. Les synthés épousent quant à eux la structure évolutive des séquenceurs et des percussions en adaptant leurs solos et leurs ambiances aux accélérations et décélérations d'une structure rythmique qui est très loin des approches minimalistes que l'on associe à la MÉ. Mes oreilles bourdonnant et les murs résonnant, "Perpertuum Mobile 1" s'amène avec sa masse d'éléments ambiosphériques et ambiosoniques. Le mouvement du séquenceur structure une ascension ovale alors que les synthés étendent des parfums anesthésiants. Ornée de très bons effets sonores, une des grandes forces de cet album, la structure évolue lentement à travers les chants des synthés. Une autre ligne de séquence s'invite. Ses accords s'ajoutent à son mouvement contigu. Son mouvement de castagnettes et les effets percussifs créent un double imparfait qui circule avec plus de vigueur alors que sobres, mais très efficaces en arrière-scène, les synthés continuent à étendre un voile chthonien. "Arrival" est un titre d'ambiances unique au répertoire de Node. Des cognements sourds, on dirait des froissements de portes métalliques, des bruits de criquets extra-terrestres, des souffles rauques dans un effet de didgeridoo et des voix marmonnées par un synthé, ces ambiances étendent une aura luciférienne où scintillent un chapelet d'arpèges miroitant dans des effets électroniques des années Exit. Des basses pulsations donnent une perception de Groove à cette structure qui clopine avec un effet hypnotique, alors que des effets percussifs, un autre élément de charme incontestable dans ce “Node Live”, stimulent une structure qui reste dans le domaine des rythmes flottants à ce titre qui flirte entre un Node classique et les approches de mélodies aériennes d'Arc. "Shinkansen South" conclut le parcours du train Japonais avec une introduction d'ambiances électroniques des années vintage. Le rythme qui se développe est construit sur des séquences qui papillonnent dans le sillage d'une bonne ligne de basse et de délices percussifs. Il monte et descend dans des boucles ovales avec des parfums des années d'or de la MÉ. Les synthés sont aussi déchainés que les séquences et les percussions qui ne cessent d'étonner notre ouïe. Ils sont en symbiose avec les phases de rythme et sculptent d'étranges chants ainsi que des harmonies ectoplasmiques, comme un concerto pour spectres qui descendent du néant aux enfers. On peut même entendre l'effet d’une guitare et ses boucles qui font écho dans un tumulte de plus en plus contrôlé par Node. Après ce rock étrange, "Shinkansen South" atterrit dans une longue finale ambiosphérique où le Mellotron règne en maître absolu dans sa brume mythique. Du bon gros Node! "Perpetuum Mobile 2" naît aussi d'un bouillon d’éléments d'ambiances avant de suivre la courbe d'un rythme flottant sis sur un maillage de pulsations et de séquences stationnaires. Les synthés sont totalement envahissants avec des nappes et des jets de sons chthoniens tout en multipliant moult effets qui détournent nos oreilles d'une formation rythmique qui s'offre comme un état d'hypnose collectif où des dizaines de troncs se balancent dans l'inconscience. Un peu comme un gros félin suivant sa proie en train d'agoniser, le rythme épouse les différents angles d'ambiances sans jamais vraiment exploser. La bête ne mangera pas en fin de compte, contenant sa furie dans une ambiance qui atteint le sommet de nos attentes. Il paraîtrait qu'il n'y a jamais eu autant d'équipements analogue sur une même scène lors de ce concert, et cela s'entend. Je l'ai déjà écrit dans ma chronique sur Node 2, jamais j'aurais pensé que tant de sons, de tons, d'éléments d'ambiances et de rythmes pouvaient sortir de ces machines…et ce dans une telle cohésion. Pour moi, ça dépasse l'entendement! Sans failles et sans une seule seconde de perdue, “Node Live” est la quintessence, le sommet de la créativité dans l'univers de la MÉ contemporaine. Un pur chef d'œuvre et un délice pour mes oreilles! Je suis convaincu que ça devrait être la même chose pour la très grande majorité des aficionados du genre Berlin School lourd et animé d'une force brute! Disponible le 18 Mai en 2000 copies CD manufacturés par DiN Records.